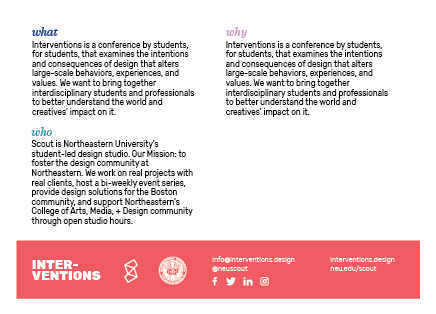 Interventions is a student-led design conference created and organized by Scout. The conference will take place this spring and explore the power that design has in our society today. 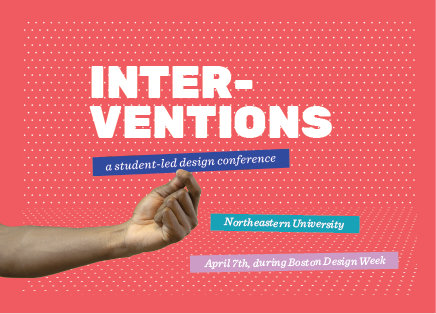 The conference’s themes include design as a tool for change, its ability to unite or divide us, and the designer’s societal responsibilities (Tickets are on sale now!). This past fall I joined the conference team as the print and collateral designer. As the print designer, I worked on various projects and collateral materials such as the speaker guidelines, sponsorship packages, marketing postcards, an animated and branded pitch deck, social media posts, and email templates. For each design, I wanted to ensure that each collateral was unique and visually distinctive while still aligning with the fun, interactive brand of the conference. Furthermore, I collaborated with the Creative Director behind the Conference brand and the Design Director at Scout, to create several solutions on how to broaden and expand the brand to be more active and interesting to the audience. We expanded the brand to include a before, during, and after state as to allow the viewer to see the process of each intervention that was occurring and the impact of each hand’s action.